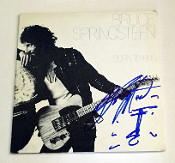 We are the home of an exclusive and rare collection of music autographs, celebrity autographs and sports memorabilia. We specialize in acquiring rare authentic autographed guitars and work with the best artists and like-minded collectors in the autograph industry. ANTHONY KIEDIS & FLEA Autographed RED HOT CHILI PEPPERS Guitar ARETHA FRANKLIN Autographed Signed Guitar with Proof ACOA RACC BONO U2 Autograph Signed OCTOBER Album Cover Authentic! ROGER WATERS Autograph Signed PINK FLOYD Guitar AUTHENTIC Proof TOM PETTY and the HEARTBREAKERS Autograph Signed Guitar PSA DNA BRUCE SPRINGSTEEN Autograph Signed THE RIVER ALBUM AUTHENTIC!